We value your feedback and comments! We would love to hear from you with your ideas and suggestions about how to improve the park. Keep checking on our webpage to see what is happening at the park and stay up to date with anything new in the park. The local Edgware donation centre is always in need of more donations. Please think about giving – you may save a life. Video of Canons Park See for yourself what a great park this is on this Youtube video! North London Collegiate School Independent school located at the north end of the park, housed in an 18th century mansion. Arnold House School Independent school which owns the playing field adjoining the park. Harrow Agenda 21 Environmental action group. Visit Harrow Information about Harrow's parks and open spaces (including Canons). Baroque Music Site with some interesting information about Handel and his links to the Canons estate. Canons Park Residents Association Local residents' association. 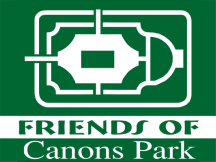 Canons Park Estate Limited Residents' association.